Shauna C. Bryce, Esq. 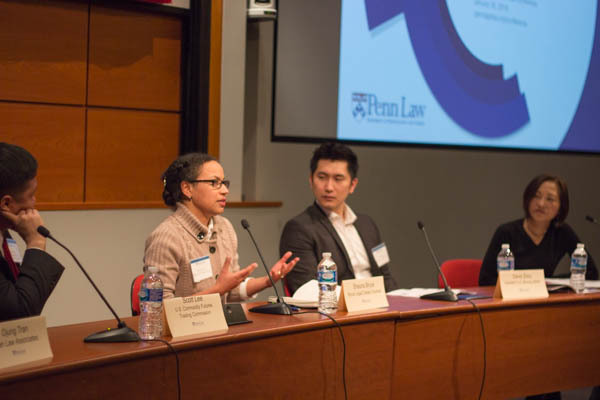 talking about career options outside BigLaw as a panelist at University of Pennsylvania School of Law’s “Carpe JDiem: Leveraging Legal Skills in Alternative Careers,” moderated by Vivia Chen of ALM’s The Careerist. Photo courtesy of PennLaw APALSA. Is another career path right for you? Leaving the practice of law—whether moving into a business or quasi-legal role where you can leverage your legal experience, or putting the legal world behind you altogether—is a big decision. A mid-level associate in BigLaw is miserable working 80-hour weeks performing due diligence for corporate transactions. She dreams of opening a classic American diner. But she has $175,000 in student debt and she knows restaurants have a high failure rate. How can she explore long-term ways of making her dream a reality? But the practice of law is all he’s ever known and he’s the sole breadwinner for his spouse and three children. Is now a good time to make a permanent break? What could he do instead? How do his lawyering skills apply to other roles? A lawyer cries on a street corner. He hates his job so much that he is ready to walk back in and quit. But is that a smart decision, financially or career-wise? How can he build an escape plan that gives him hope and increases his likelihood of a successful break into work that would be more fulfilling? *Samples are composites designed to protect the identities of individual attorneys. What will you do instead of practicing law? How far away from traditional practice of law are you considering? Do you want something law-related? Or totally different? How much will the new career pay? Can you afford the pay cut you might take by leaving the practice of law? Can you transition back to the practice of law or a law-related field if you change your mind? How do you build the skills, credentials, experiences, and connections to be successful at that alternative career? How much prep work can you do before you leave to ease the transition? Would moving to a different workplace environment be a better solution? Would changing practice areas, geography, or making some other change within the practice of law work better, either temporarily or long-term? If you’re considering leaving the law, then it helps to have a professional career coach assist in thinking through the process so that you can be sure leaving is right for you, decide on different career paths that might be a better fit, and make other critical career decisions. Together, you can build a transitional bridge to increase the likelihood of a successful move from the law to an alternative career, as well as to help prepare you for what to expect. In many cases, you may want to revise your LinkedIn profile so that it too supports your move—without prematurely revealing your intentions to your current employer. That means a bridge LinkedIn profile until you’re ready to launch your new career and then—on your schedule, when you’re ready—a new LinkedIn profile to complete your transition.